Hello everybody and welcome back to the Everything Ham Radio Podcast! 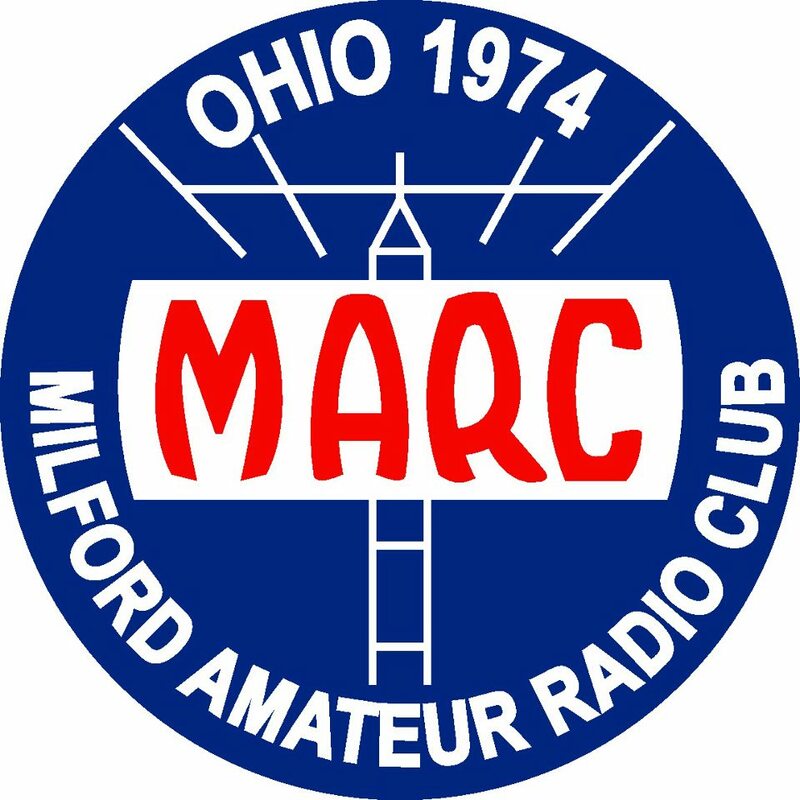 In this episode we are going to be talking about Batteries, the Milford Amateur Radio Club, Upcoming events and hamfests for the next two weeks and wrap up the episode with some news from around the community! Nearly all large rechargeable batteries in common use are Lead-Acid type. The acid is typically 30% Sulfuric acid and 70% water at full charge. NiFe (Nickel-Iron) batteries are also available. These have a very long life, but rather poor efficiency (60-70%) and the voltages are different, making it more difficult to match up with standard 12v/24/48v systems and inverters. Sometimes called “fork lift”, “traction” or “stationary” batteries, are used where power is needed over a longer period of time, and are designed to be “deep cycled”, or discharged down as low as 20% of full charge (80% DOD, or Depth of Discharge). Deep cycle batteries have much thicker plates than automotive batteries. They are often used in larger PV systems because you can get a lot of storage in a single (very large and heavy) battery. Plate thickness (of the Positive plate) matters because of a factor called “positive grid corrosion”. This ranks among the top 3 reasons for battery failure. The positive (+) plate is what gets eaten away gradually over time, so eventually there is nothing left – it all falls to the bottom as sediment. Thicker plates are directly related to longer life, so other things being equal, the battery with the thickest plates will last the longest. Automotive batteries typically have plates about .040″ (4/100″) thick, while forklift batteries may have plates more than 1/4″ (.265″ for example in larger RollsSurrette) thick – almost 7 times as thick as auto batteries. The typical golf cart will have plates that are around .07 to .11″ thick. While plate thickness is not the only factor in how many deep cycles a battery can take before it dies, it is the most important one. Flooded batteries are the most common type of battery. They require maintenance (check acid level, add water). They can spill and leak if not stored properly (upright). Sealed batteries are made with vents that cannot be removed. The so-called â€œMaintenance Freeâ€ batteries are also sealed, but are not usually leak proof. Sealed batteries are not totally sealed, as they must allow gas to vent during charging. If overcharged too many times, some of these batteries can lose enough water that they will die before their time. There is no way to add water. Gelled batteries, or “Gel Cells” contain acid that has been “gelled” by the addition of Silica Gel, turning the acid into a solid mass that looks like gooey Jell-O. It is impossible to spill acid even if they are broken. However, they must be charged at a slower rate (C/20) to prevent excess gas from damaging the cells. They cannot be fast charged or they may be permanently damaged. This is not usually a problem with solar electric systems, but current must be limited to the manufacturers specifications. Not typically used any more, replaced by AGM. A newer type of sealed battery uses “Absorbed Glass Mats”, between the plates. This is a very fine fiber BoronSilicate glass mat. These are also called “starved electrolyte”, as the mat is about 95% saturated rather than fully soaked. That also means that they will not leak acid even if broken. Nearly all AGM batteries are “recombinantâ€œ. The oxygen and hydrogen recombine INSIDE the battery, turning back into water while charging and prevent the loss of water through electrolysis. The recombining is typically 99+% efficient, so almost no water is lost. It is absolutely crucial to understand that batteries must be charged at the battery manufacturers specification! A battery that does not charge at the proper voltage will never, ever, achieve a full charge. Lots of people make this mistake and either assume that all batteries use the same voltage or use what the charge controller says. WRONG! 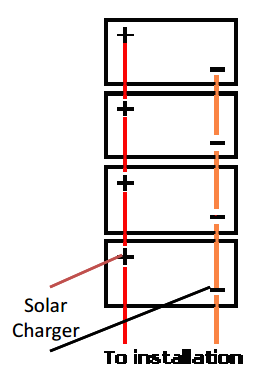 The connections to the main installation are all taken from one end, i.e. from the end battery. The interconnecting leads will have some resistance. It will be low, but it still exists, and at the level of charge and discharge currents we see in these installations, the resistance will be significant in that it will have a measurable effect. If we draw 100 amps from this battery bank we will effectively be drawing 25 amps from each battery. Or so we think. In actual fact what we find is that more current is drawn from the bottom battery, with the current draw getting progressively less as we get towards the top of the diagram. The effect is greater than would be expected. Whilst this diagram looks simple, the calculation is incredibly difficult to do completely because the internal resistance of the batteries affects the outcome so much. However look at where the load would be connected. The power coming from the bottom battery only has to travel through the main connection leads. 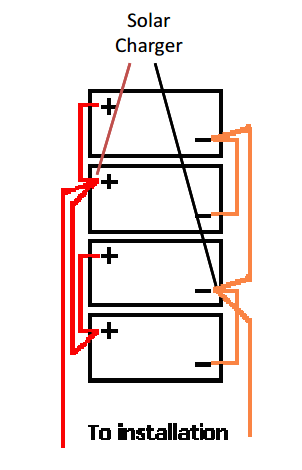 The power from the next battery up has to travel through the same main connection leads but in addition also has to travel through the 2 interconnecting leads to the next battery. The next battery up has to go through 4 sets of interconnecting leads. The top one has to go through 6 sets of interconnecting leads. So the top battery will be providing much less current than the bottom battery. During charging exactly the same thing happens, the bottom battery gets charged with a higher current than the top battery. The result is that the bottom battery is worked harder, discharged harder, charged harder. It fails earlier. The batteries are not being treated equally. The problem is that in very low resistance circuits (as we have here) huge differences in current can be produced by tiny variations in battery voltage. I’m not going to produce the calculations here because they really are quite horrific. I actually used a PC based simulator to produce these results because it is simply too time consuming to do them by hand. The bottom battery provides 35.9 amps of this. The next battery up provides 26.2 amps. The next battery up provides 20.4 amps. The top battery provides 17.8 amps. So the bottom battery provides over twice the current of the top battery. 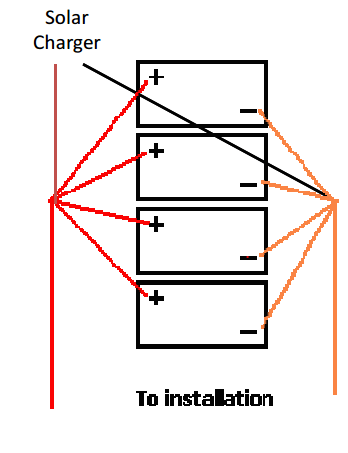 In this diagram the main feeds to the rest of the installation are from diagonally opposite posts. Everything else in the installation remains identical. Also, it doesn’t matter which lead (positive or negative) is moved, Whichever is easiest is the correct one to move. The results of this modification, when compared to the original diagram are shown: With the same 100 amp load…. The bottom battery provides 26.7 amps of this. The next battery up provides 23.2 amps. The top battery provides 26.7 amps. This looks more complicated. It is actually quite simple to achieve but requires two extra interconnecting links and two terminal posts. Note that it is important that all 4 links on each side are the same length otherwise one of the main benefits (that of equal resistance between each battery and the loads) is lost. The difference in results between this and the 2nd example are much smaller than the differences between the 1st and 2nd but with expensive batteries it might be worth the additional work. This method isn’t always so easy to install because of the required terminal posts. In some installations there is simply no room to fit these. Especially when using a large quantity of batteries (8, 16, etc). Another wiring method that achieves perfect battery balancing. What has been done here is to start with 2 pairs of batteries. Each wired in the proper “cross diagonal” method. Then each pair is wired together, again in the cross diagonal method. Notice that for each individual battery, the current always goes through a total of one long link and one short link before reaching the loads. This method also achieves perfect balance between all 4 batteries and may be easier to wire up in some installations. 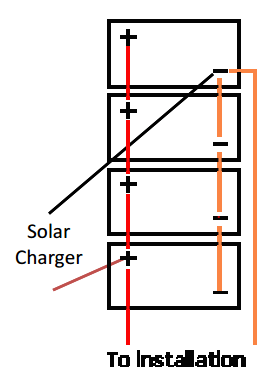 The previous examples demonstrate wiring concerns when using 12V charging from the solar charger. However, consider the using 24V or 48V storage might be more appropriate. This can be done by wiring several 12V systems in series. It can get complicated. With 12V storage, you need to use very heavy wire to reduce the voltage loss when using high amps. With 24V or 48V storage, you can use much lighter wire because your amperage will be lower by comparison. This can make your installation easier and cheaper. Lead-acid batteries temporarily lose approximately 20% of their effective capacity when their temperature falls to 30Â°F (-1Â°C). This is compared to their rated capacity at a standard temperature of 77Â°F (25Â°C). At higher temperatures, their rate of permanent degradation increases. So it is desirable to protect batteries from temperature extremes. Where low temperatures cannot be avoided, buy a larger battery bank to compensate for their reduced capacity in the winter. Avoid direct radiant heat sources that will cause some cells to get warmer than others. The 77Â°F temperature standard is not sacred, it is simply the standard for measurement of capacity. An ideal range is between 50 and 85Â°F (10-29Â°C). Arrange batteries so they all stay at the same temperature. If they are against an exterior wall, insulate the wall and leave room for air to circulate. Leave air gaps of about 1/2 inch (13 mm) between batteries, so those in the middle don’t get warmer than the others. The enclosure should keep the batteries clean and dry, but a minimum of ventilation is required by the National Electrical Code, Article 490.9(A). A battery enclosure must provide easy access for maintenance, especially for flooded batteries. Do not install any switches, breakers, or other spark-producing devices in the enclosure. They will ignite an explosion of the hydrogen gas bubbles gassing out during charging. Are you looking for some new radio gear? Maybe you need a new computer for your shack? Did you lose a piece off you tower and you just can’t find it without a metal detector? You can find all this and more at GigaParts.com. While you are there, check out the Nanuk cases! These cases are awesome! They are made of hard exterior and a soft foam interior. Both the inside foam and the outside can be customized to meet your purposes! Why Nanuk? Because they are awesome! Check out all the options that are currently in stock at GigaParts right now! …at checkout to receive 10% off the price of the case! A great story sent by David Richer, WB6VGO about how amateurs helped rescue a sinking vessel in the Pacific. On September 28, 2016 at approximately 0300 UTC, Charles Houlihan, KD6SPJ, a net relay relay station for the Pacific Seafarerâ€™s net while monitoring 14.300 received a call for assistance from the captain of the Sailing Vessel (SV) Rafiki. The captain reported that the SV Rafiki, a 35 foot sailing vessel, was taking on water. Charles who was the captain of the SV Jacaranda and located at sea, contacted Randy VanLeeuwen, KH6RC also a net relay and located in Hawaii. Randy contacted the US Coast Guard Station to report the incident and provide Rafikiâ€™s location, 230 miles south of Cold Bay, Alaska. Randy remained in constant radio contact with the Rafiki until contact with lost. Fred Moore W3ZU (Florida) and Peter Mott, ZL1PWM (New Zealand) additional net relays maintained contact with the captain of the Rafiki until the arrival of the Coast Guard the subsequent rescue. According to a press release issued by the United States Coast Guard Stationâ€“17th District, a Coast Guard Air Station Kodiak MH-60 Jayhawk helicopter and an Air Station Kodiak HC-130 Hercules were dispatched to the Rafikiâ€™s last reported position. Upon arrival the crew of the Jayhawk helicopter were successfully able to hoist the captain and one additional crew member to safety aboard the helicopter.around 1000 hours UTC. Both men were reported to be uninjured. The vessel was abandoned. This real-life incident happened during the daily â€œroll-callâ€ conducted by the amatuer radio operators (or â€œhamsâ€) and members of the Pacific Seafarers Net. Everyday at 0300 UTC amateur radio operators from North America, Hawaii, New Zealand and Australia monitor the progress of maritime amateur radio operators who are sailing on the Pacific. Prior to the start of the roll call for â€œmaritime mobileâ€ vessels, a call for medical, emergency or priority traffic is broadcasted. It was after such a call for any emergency traffic that the call for assistance from the Rafiki was received. John Crockett, W3KH, of Columbia, South Carolina, died on October 12. An ARRL Life Member, he was 69. Licensed in 1963, Crockett was the developer of and project manager for the Southeastern Repeater Association (SERA) Universal Coordination System, as well as project manager for the entire SCHEART system, analog VHF and UHF linked repeaters, and, most recently, the Digital Mobile Radio linked repeater system. He was a member of the SERA Board of Directors and served as SERA Vice President. Crockett worked with the South Carolina State Guard, sponsoring licensing classes and was a mentor and technical advisor. He was President of the Columbia Amateur Radio Club. In 2011, Boehner and past Roanoke Division Director Dennis Bodson, W4PWF (SK), presented Crockett with the Roanoke Division ARRL Vic Clark W4KFC Service Award for his contributions to Amateur Radio. Crockett was an electrical engineer and, in his professional life, was Vice President of Engineering for the South Carolina Educational Television. 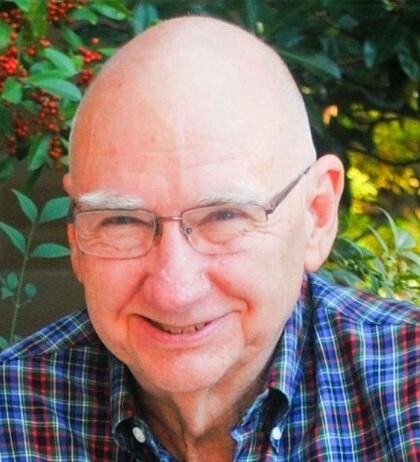 He was an ardent advocate of emergency communication and served as net manager for the South Carolina Statewide ARES VHF/UHF Net, which met on the SC HEART Linked Repeater System. Crockett served in the US Air Force and was a Vietnam War veteran. In the past, he held the call signs KC4YI, WA3EAJ, WA4EVC, WA4VUS, and HS3MC. Boehner said Crockett was a strong supporter of the ARRL and very modest of his accomplishments. â€œWhen I think of an individual who has truly made a difference in Amateur Radio, his name comes right to the top,â€ Boehner said.